It’s been almost 2 months since we covered the SW Florida housing supply and even longer since we covered the traditional sales versus distressed sales with breakdowns by month. Since both affect our market and tell a story, we thought we’d revisit the issue which may lead to clues on where the market is heading into season. Listings for single family homes and villas has increased by about 500 in the past month which has increased the months supply of inventory to 3.8 months, up from 3.5 months the previous month. When new inventory hits the market there is a lag because we calculate past sales into existing inventory to derive this number. Since the inventory wasn’t available to sell until now, there’s no way it could close. Because properties are being scooped up almost as fast as they hit the market, the months supply will come down, all else being equal. When we look at the breakdown of sales by month, we see traditional sales rising by 96 sales over last October. Short sales are roughly the same, but you’ll notice a big difference in foreclosures, or REO’s (Real Estate Owned). Foreclosures are less than half of what they were last year, and traditional sales are rising as prices increase. More sellers can afford to sell as the prices rise. Banks have worked hard at accepting short sales in lieu of having to sell at foreclosure months later. Because the SW Florida real estate market was artificially too low, there has been upward pricing pressure. This is why median sale prices jumped $10,000 in October over September. Heading into season we could see more of the same. We know prices fell too far because they were far below replacement cost, which essentially cooled the jets of the building industry for a several years, however now that prices are rising builders have found ways to build again at lower cost points. With each rising price point it becomes feasible for builders to build again. Building bolsters our local economy in so many ways, so it’s nice to see that, especially since building was such a large component of the SW Florida economy. The SW Florida real estate market is set to take off even further once the overall economy improves. We’re seeing price gains now simply because we were undervalued. We’ll see more once traditional demand picks up. We think there is pent-up supply and pent-up demand just waiting to attack our market. Both will rise as the economy improves, and each may temper the other. We have many sellers who would like to sell once prices rise enough to cover their mortgage. They are current on their payments but strapped in their home. We have buyers who’d like to buy but need to sell a home first, or are just waiting until they feel better about business. You’ve heard the term a rising tide will lift all boats, and the same is true with the economy. Once that happens, this market could blast off. 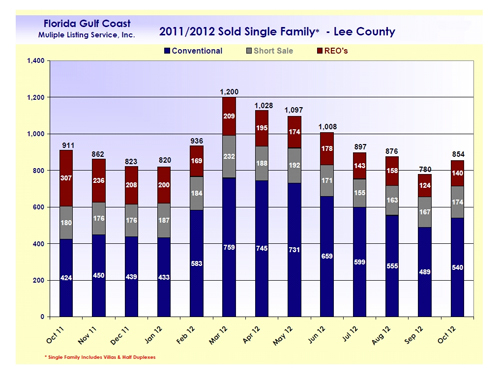 Posted in Southwest Florida Real Estate.Tagged Cape Coral real estate market, December home sales.